EVP research by Michael Esposito, Case File 142 from source recordings done by Francisco Meirino at an ancient school of anatomy, now a library, in Lausanne, Switzerland 2011. Assembled, edited and mastered by Francisco Meirino at Shiver Mobile, Nov-Dec. 2011.
was born 1964 in Gary, Indiana. He is an experimental artist and researcher in Electronic Voice Phenomena (EVP). An ancestor of Alfred Vail, who invented the Morse Code and several early telegraph devices with his partner Samuel Morse. Another ancestor, Jonathan Harned Vail was office manager and assistant to Thomas Edison in his later years when Edison was attempting to develop a device to communicate with the dead. Michael studied communication theory at Purdue University, University of Notre Dame, American University in Cairo, Egypt and Governor&apos;s State University. Over the years, under the Phantom Airwaves institution, Michael has participated in hundreds of paranormal investigations all over the world. He has conducted extensive research at many active locations and has developed a great deal of unique theory and devised many unique experiments within the field of EVP. Focusing primarily on EVP research, he has collected tens of thousands EVPs and video. EVP research is commonplace within the catalog of Firework Editions, a Swedish label run in part by the conceptual artist Leif Elggren. One of Elggren&apos;s more infamous projects is the Kingdom of Elgaland-Vargaland which occupies a liminal political space between the boundaries of countries; but within the magisterial constitution, Elgaland-Vargaland annexes the psychic realm of dreams and even goes so far as to abolish death. With this proclamation, the kingdom offers citizenship to ghosts, spirits, and apparitions; and seeks communion with such entities through EVP - Electronic Voice Phenomenon - whereby voices of unknown origin mysteriously appear on the electronic mediums of tape, radio, and digital recorders. EVP researchers like Chicago&apos;s Michael Esposito claim these voices to originate from spirits beyond the grave; and there&apos;s quite of lot of late night entertainment coming from their spooky if questionable paranormal research. Esposito seems to hold more of a metaphysical and poetic agenda in his work, by reaching out to the sound art community as a crucible for his admittedly unnerving recordings. He&apos;s collaborated with the aforementioned Elggren, fellow Elgaland-Vargaland cohort CM von Hausswolff, John Duncan, FM Einheint, and now Francisco Meirino. Esposito&apos;s role in this collaboration with the electro-acoustic artist Francisco Meirino is that of a taxonomist, with Meirino doing most of the heavy lifting on the album. Meirino made a series of field recordings in a former school of anatomy in his native Switzerland; and upon hearing something odd in the recordings, he passed everything onto Esposito, who in turn discovered over 30 incidents of EVP in Meirino&apos;s original recordings. Those discovered events became the inspiration and source material for Meirino&apos;s composition which blisters with static bursts of noise, caustic flares of electricity, and hissing fields of magnetic disturbances. Amidst these jarring events (which come together as a something not dissimilar to the Hafler Trio, Joe Colley, or G*Park), Meirino cycles through the EVP material in repetitive phrases. It&apos;s still not all that easy to hear what Esposito claims to be in these recordings, but the mechanoid repetitions lend to a very cold and disembodied aesthetic which couples perfectly with Meirino&apos;s splinterings of electro-acoustic sound. Esposito may have been the inspiration for the album; but it&apos;s Meirino who makes it all sound so damn good. 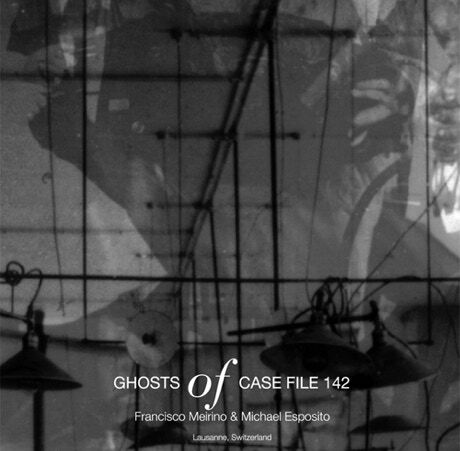 Tonight a CD by Francisco Meirino and Michael Esposito entitled 01″ Ghosts of case file 142. I have a few difficulties with this particular release. not because of how it sounds, which is actually quite good, but with the claims of where the source material originates. The album contains a single forty minute track that was assembled by Meirino from “EVP research” recordings made by Esposito at a library in Lausanne, Switzerland, that was once a school of anatomy. I read this myself casually, while listening for the first time, not really knowing what EVP research might be, but a bit of simple googling later revealed that Esposito’s sounds then are apparently the sounds of paranormal activity. Clearly, obviously, they aren’t, but instead the recordings Esposito has collected are strange anomalies found in the airwaves that offer thoroughly interesting questions around how we can perceive them to be similar to human voices. As a confirmed rationalist then, I will consider this album of music purely for its abstract audio qualities, but its worth noting how remarkable a set of sounds can be found out there if you look in the right places. The music here then sounds mostly electronic, often not unlike analogue synth sounds, often crossing into shortwave radio areas and with occasional percussive elements. The sounds have been arranged relatively simply, without too much going on at one time and with a fair amount of room to breathe compositionally. The various strange sounds then are placed against one another to that a quiet hum might be offset by a louder queasy throb or feisty white noise might wrap around a gentle chime. Long periods of brooding calm will often suddenly burst into passages of more garish activity, but the album always seems to keep itself generally on the quieter side. While on the whole the album makes fine use of the wide array of quirky, unusual sounds, offsetting them against each other in interesting ways, there is also a fair degree of repetition and looping of sounds that reminds us that ultimately this is a bunch of samples pulled together rather than anything more organic. Hearing the same sounds repeated at times takes away some of the originality of the sounds here, but generally the piece is a well crafted work that makes the most of the spectrum of sounds captured by Esposito. Despite its silly title, 01: Ghosts of case file 142 is generally speaking though a well formed, attention holding work that holds up well as an gentle, airy composition. If you like me you enjoy neatly arranged electro-acoustic constructions with a fair degree of contemplative silence threaded through then this is well worth a listen, if you rare able to separate it from all of the ghost story stuff.